P&O Cruises | Frequently Asked Questions | On Shore - Why book a P&O Cruises shore excursion? You are here: Home > Advice centre > Shore Excursions > Why book a P&O Cruises shore excursion? Q. Why book a P&O Cruises shore excursion? Iconic sights, awe-inspiring scenery, and compelling local cultures - each port of call is brimming with exciting possibilities. To help you experience the very best from your destinations, P&O Cruises offers a diverse selection of excursions ashore, from leisurely sightseeing to exciting activities. Shore excursions are created by a team of destination experts who work closely with carefully selected, reliable local operators and are designed to suit all ages, interests and abilities. Once you’ve booked your holiday, you’ll be able to browse through excursions tailored to your specific cruise and purchase your tours in advance through Cruise Personaliser. 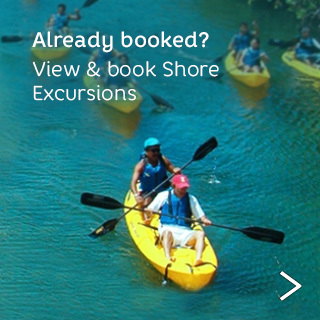 Once you log in to your booking, you will also be able to see more shore excursion images and watch a selection of tour videos to bring your tours alive. Places are limited on some excursions and the most popular tend to sell out early, so the sooner you book, the better. Booking ahead also helps you to spread the cost of your holiday. How can I book a shore excursion? When can I book shore excursions? Can I book my Shore Excursions on board? What are the benefits of booking a shore excursion?